Majesty is a 1000 piece jigsaw puzzle designed by artist Alan Giana. White steps lead into a magical and colorful garden. Birds, butterflies and flowers fill the landscape and lead to a mountainous view in the distance. Available in two piece counts. Especially For You is a 1000 piece jigsaw puzzle designed by artist Tricia Reilly-Matthews. A pony tailed girl emerges from a flower shop with a bouquet of fresh picked colorful flowers. A golden puppy and tiny kitten look on with loving admiration. Available in two piece counts. Oakworth Station is a 1000 piece jigsaw puzzle designed by artist Trevor Mitchell. An audience of grandparents, parents and children watch as the train approaches the station. The brick rail station is set in the lush countryside with rolling hill. Available in two piece counts. Picturesque Covered Bridge is a 1000 piece jigsaw puzzle designed by artist Nicky Boehme. An old wisteria tree in bloom grows on the side of the river next to the covered bridge built in 1873. A white steeple church welcomes visitors to the quiet hamlet on the other side of the gentle river. Available in two piece counts. 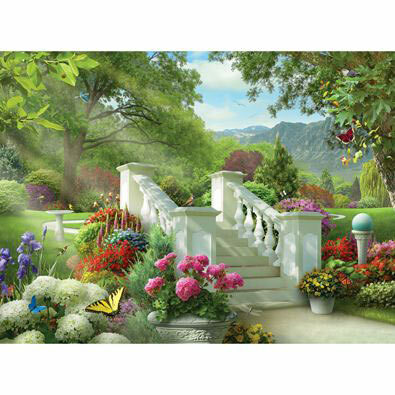 This 1000 piece jigsaw puzzle is designed by Sally J.Smith and measures 20" x 27". This puzzle depicts a group of Native Americans communing with the spirit of a wolf. Available in two piece counts.